Wild bird behavior and how it affect the bird/owner relationship. The best and worst ways to modify pet bird behavior. Sidebars on the myths and misconceptions of keeping pet parrots. 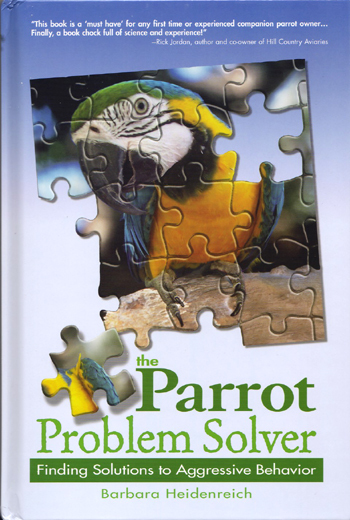 The Parrot Problem Solver: Finding Solutions to Aggressive Behavior is a one-top resource for bird owners frustrated by problem behavior. By following the author's tips and techniques, any owner can learn how to keep a companion parrot from biting, screaming, or lunging, and turn a beastly bird into an avian angel. Barbara is a professional animal trainer and founder of Animal Training and Consulting Services, which provides animal training workshops to zoos and other wildlife facilities. She has written and lectured extensively on the training of parrots. Barbara is the president of the International Association of Avian Trainers and Educators.